A few years ago I had my first sticky toffee pudding. A rich, moist cake drowned in a sea of toffee liquid goodness. How can that be anything but awesome for a sugar junky? 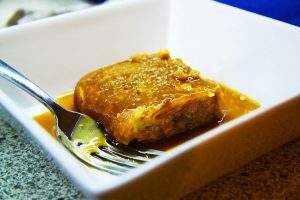 This past week, I have been craving this toffee goodness, and decided to Google for a recipe to try. Of course the Internet contains a ton of recipes . . .But how do you know if theyâ€™re going to be any good? What is the best recipe? Thatâ€™s when I spotted my tried and belovedÂ joyofbaking.com. I didnâ€™t realize they had a sticky toffee pudding recipe but I was delighted to find it. Why?Â joyofbaking.comÂ is, in my opinion one of the best baking sites on the web. Not only does it have a plethora of great recipes for baking, but it has one of the best layouts for a recipe site that I know; and yes, that is extremely important. The site organizes itself into several different categories, so you can easily find your way through different types of baking (cookies, muffins, cakes, healthy baking etc. ), different ingredients (chocolate, strawberry etc.,) holidays (Christmas, Valentineâ€™s etc.,) or styles Â (quick breads, puddings etc). So if your feeling in the mood to bake, but not quite sure what, or if you are perhaps in excess of some fine strawberries and want to find a recipe to use them in, you can easily find a great recipe to try out. Have something specific in mind? The search box at the top weâ€™ll bring up a list of excellent results specific to your query. (I find a good search box important, because still too many websites out there seem to fail at providing a good search too- leading to just a list of unclear, poorly labeled results you have to sift through). Any of the resulting pages are laid out uniformly and are well-organized. The topical pages all contain nice-sized photos of each of the recipes, and a short description. The photos big enough to get your mouth watering, but you see several results on a page. Intermittent among the results is a little more information on whatever the topic of the page is pertaining to. Although the site has ads, and some are a bit on the annoying side (flash and all), they are not in the way of the results and I have not been subjected to pop-up ads or scrolly ads on the site. Most recipes include a video instruction as well, which is handy if you want to see the action yourself, even if the recipe is relatively a simple one, Stephani Jaworski does a pretty good job with the videos, although I like some videos better than others as she provides more description in some videos. One nice feature is that each recipe contains some sort of background information on the recipe itself: the history, the style of baking or the ingredients are explained in one or two paragraphs. I really like this, as someone who loves to understand a bit of whatâ€™s behind what they are baking. Of course the recipes are presented all uniformly (i.e., in the same format) and there is good instruction to make it easy to folllow. Â Plus (and this is huge for me), the recipes are given in cupsÂ andÂ grams (or mls) AND she gives temperatures in Celsius and Fahrenheit too! This is fabulous especially since we use a scale more and more for baking (a much more efficient system if I may say so and our oven is in Celsius, just makes it one less thing to convert!). The website also includes a list of substitutions, conversions and a glossary, all of which are handy to have. Stephanie also provides a bibliography of all the references used in the making of these recipes, which is great to know the source material. These little extras makeÂ joyofbaking.comÂ the perfect baking website. The recipes provided are all tested by Stephanie herself, and since she includes videos of most, we know that they work at least in her kitchen. (And I well testify that many have been successful in mine as well). So thank you Stephanie and Rick Jaworski for a fabulous baking site. You are my go to baking reference. Oh, and that sticky toffee pudding was scrumptious. ?